There’s a lot to remember when you’re learning bachata — do not forget the flair! Hip-swiveling sass is important from the start, but then come the complicated posture, partner work and turns. WORKING IN THE flair is my favorite — and the most challenging — part of any dance class. So when we started a Bachata Level I Intro Series class with warm-ups to learn how to swivel our torsos and our hips, I was thrilled. Finally, I was getting a breakdown on the fun stuff right away. 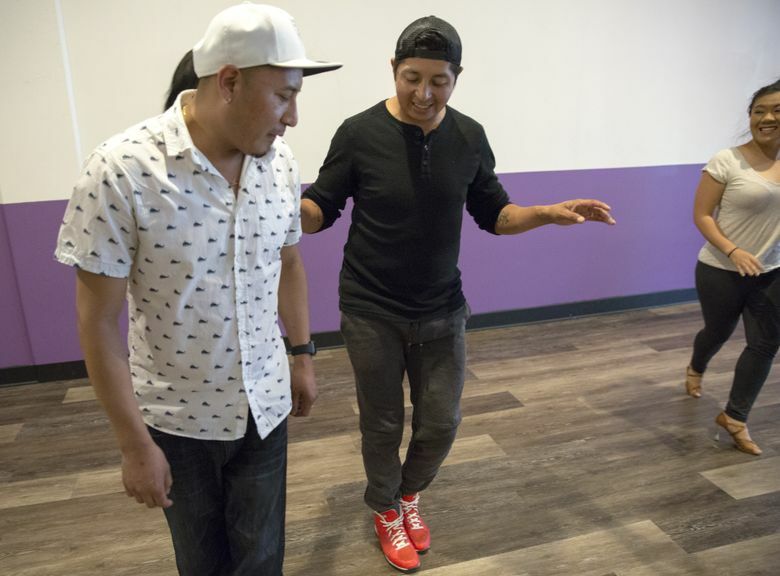 I was at Belltown Dance Studio to learn bachata, a social dance from the Dominican Republic. What distinguishes bachata from other dances, in addition to its music, is an eight-count foundation, and a proper, upright torso, at least when you are a beginner. 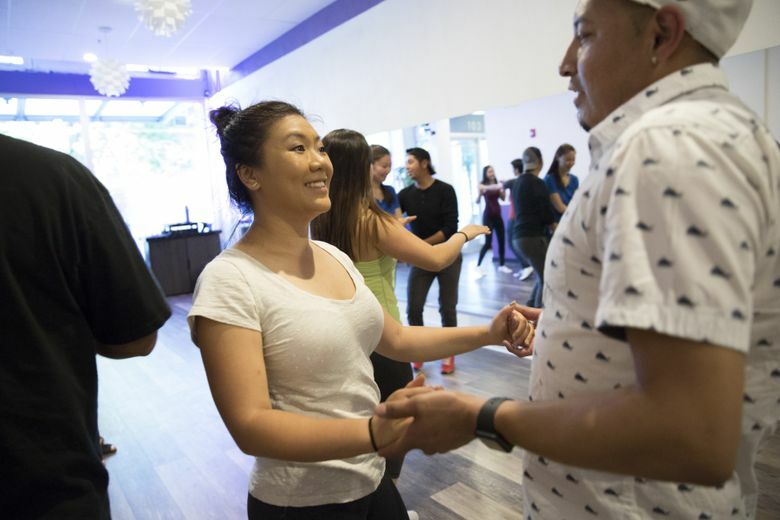 It’s romantic, instructor Jaime Rubio explained, though there are lots of offshoots of bachata styles these days. After our warm-ups, we worked into the basic step: three steps to the left, with your right foot pausing on the ball of your foot, and a sassy hip pop for good measure, then the same to the right. You can take this foundation forward and backward, or stay in place. Teacher Yuki Liang demonstrated how to sway your hips while doing the pop. I was determined to keep the sass. We moved into turns, which was fine until Liang had us work on spotting our gazes at one point on the wall, then whipping our heads around. This will keep you from getting dizzy, she explained. Except for me: The spotting made me lose my bearings. I made a mental note to work on it. It was time to work with partners. Liang and Rubio emphasized the need for everyone to be upright in posture. Liang told the women to squeeze their lats, and follow from their back muscles, not their arms. Relax your biceps, she said, and walked around repositioning us. When I partnered with her, she adjusted my shoulders and told me to let my wrists hang heavier. When Rubio saw people using their arms a lot, he stopped us and showed us again how to stand, upright, with arms relaxed and relatively still. Moving your arms a lot is merengue, he said, not bachata. The followers worked first, with eyes closed, while the leads practiced guiding us side-to-side or forward and back. Soon, we opened our eyes and practiced the basic step together. We kept trading partners, and whenever I made it to Rubio or Liang, they reminded me to follow, not anticipate. The best bachata dancers aren’t doing the dance from technique, Rubio said. “It’s not about knowing; it’s about feeling,” he said. It was time to add the turns. The leads had to figure out the complex hand movements to signal a turn to their partners, while I had to remember to keep my posture and not anticipate where we were going. Somewhere in the midst of all my focus on turns and posture, I saw another dancer do a hip bump in her basic step. I was so focused, I had forgotten about my flair. And suddenly, we were done. I loved bachata more than I expected, probably because of the hip swivels and pops. I’m not naturally good at it, but I want to be. With practice, I felt like it was possible. The intro series goes for another five classes. My hope is that if you commit to the full series, you’d get it all — the good posture; the partner work; the turns; and, most important to me, the sass.